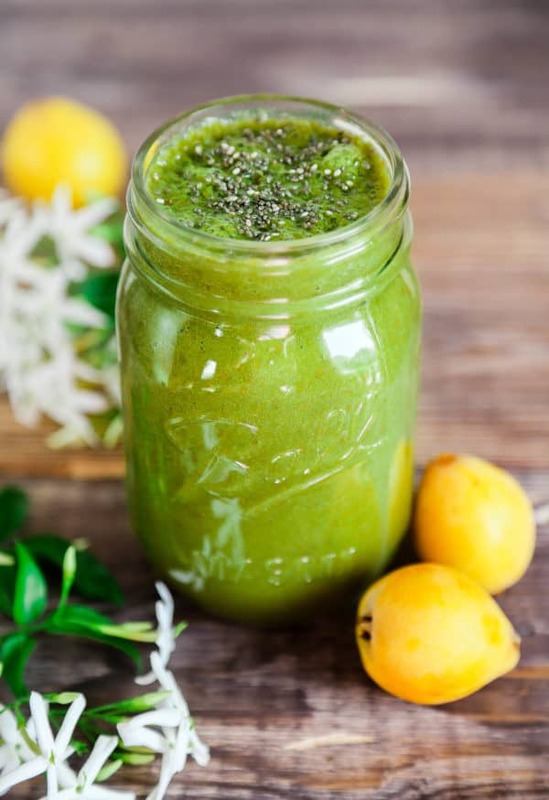 Spinach loquat smoothie is a refreshing green smoothie! I’m obsessed with green smoothies, and loquats are now in season, so I decided to make a loquat green smoothie! My parents have a few loquat trees growing in their garden in Jordan, and yes you guessed it, this is where I got the loquats from! They’re fresh, organic, and most importantly they taste great! There are different kinds of loquats, but the ones that grow at my parents’ garden are SWEET! This is very simple, to build a wonderful green smoothie you need 3 things. 5. Blend it up! You can also add ice, and blend until smooth. Enjoy! 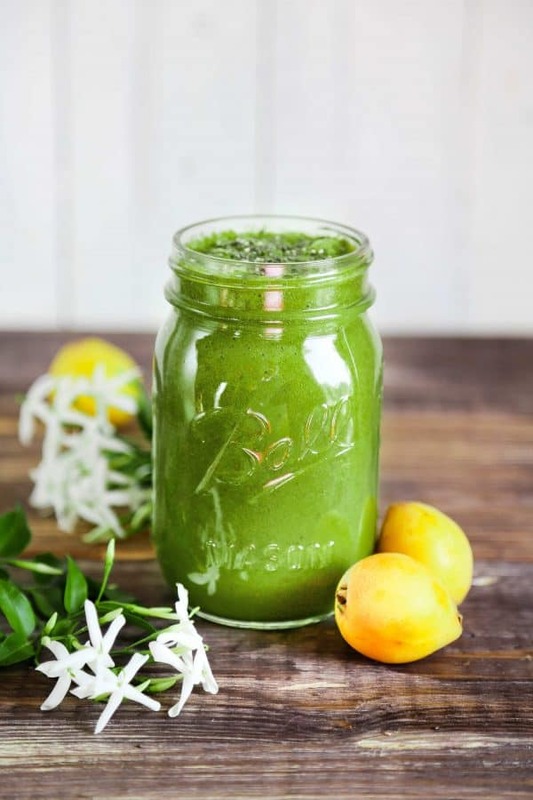 Throw a banana, loquats, spinach leaves, and water in a blender. Blend it up, pour in a glass (or a jar!) and top with chia seeds. Just gorgeous! I’m in love with green smoothies too. You just can’t beat them. I’m smoothie obsessed too! This looks so healthy and delicious. I love the chia seeds on top. I’ve never heard of loquats but I can’t wait to try them! Gorgeous shot! This green smoothie is looks so good and healthy! I’ve never had a loquat, but this smoothie looks great! I’ve never heard of loquats but the way you described them I’m guessing this is delicious!! I’ll have to look for them! This looks like it’s packed with flavor and good energy! I’ve never tried a loquat either – is it similar to a kumquat? I have never heard of loquats…do they come under another name? One healthy smoothie you have there. 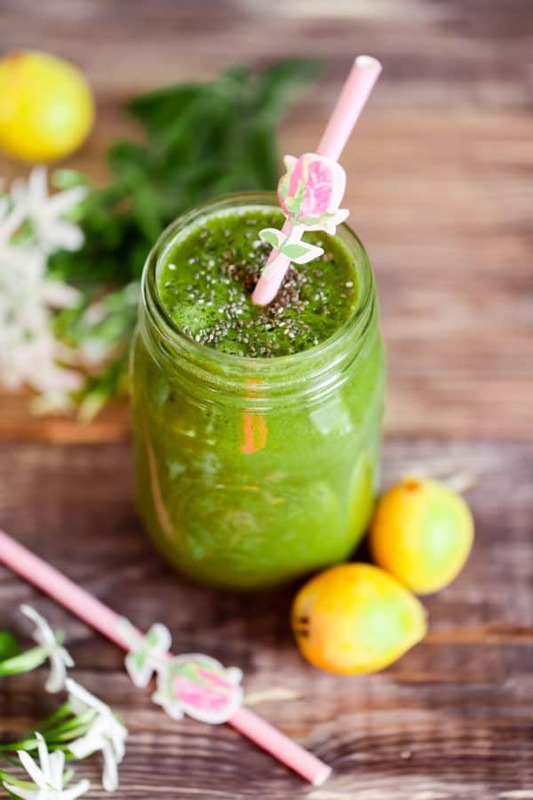 You can never go wrong with a beautiful green smoothie! Pinned! Oh, my mom has loquat trees in her yard. I’ll have to run by there and pick some up and try this. I need some different healthy smoothies in my life. This looks so delicious! They way I have been skipping breakfast lately I think I need to get back into healthy smoothies. I am curious about loquats – never had the pleasure! Gorgeous and very healthy too! I need more green smoothies in my life! I have never tried a loquat though. What do they taste like?